HyLite is excited to announce the expansion of its popular Arc-Cob series with the introduction of a 100W Model. The 100W HyLite LED Arc-Cob provides illumination equivalent to a 400W Metal Halide and HPS. The 100W HyLite LED Arc-Cob offers 120° directional illumination with high efficacy (113 lumens per watt.) HyLite’s proprietary-designed heat sink with Thermax™ Technology allows for up to 60,000 hours of rated lamp life and use in fully enclosed fixtures. 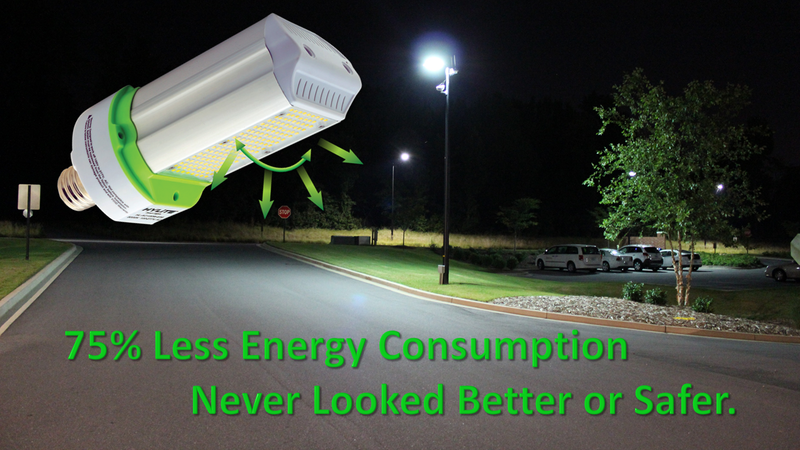 With its compact size, the 100W Arc-Cob retrofit lamp is designed to be seamlessly retrofitted into wall packs, street lights, parking lot, and floodlights to reduce the negative financial and environmental impact of traditional lighting. Installation is quick and easy. Simply bypass the ballast and screw-in the lamp. Once the ballast is bypassed, energy use is reduced by 78%. The 100W HyLite LED Arc-Cob is available in Type III and Type V distribution patterns and works on Universal Voltage (120v to 277V). To ensure years of sustainable lighting, HyLite provides a 10kA/20kV surge protection device with each lamp. Upgrading to LED Lighting is an investment and the HyLite 10kA/20kV provides protection on that investment. The HyLite LED Arc-Cob is a truly sustainable lighting retrofit solution. Like all HyLite LED products, the 100W Arc-Cob is 98% recyclable and does not contain any hazardous materials. It is RoHS Compliant and CE & UL approved for Safety. For more specifications, please visit the HyLite LED Arc-Cob page here.